Dr. Darwish received his B.Sc. and M.Sc. from Cairo University, in 1981 & 1984 and received his Ph.D. in Computer Engineering from the University of California, Davis in 1988. He received the Egyptian National Engineering Award for the year 1999. Dr. Darwish was selected by Singapore to receive the Middle East Eminent Persons Award (MEEP)-2007 in recognition for his work. He also Received the Life Time Achievement Medal for his distinguished career from University of California, Davis in 2017. His 2 last public positions were Minister of State for Administration Development (2004-2011) and Chairman of the Suez Canal Economic Zone (2015-2017). As a Chairman of the SCZone, he laid the foundation of one of largest Special Economic Zones in the world (461 sq km and 6 ports). As the Minister of State for Administration Development (2004-2011). This included three major portfolios; e-Government, Institutional and Human Resources Development and Governance Institutionalization (including transparency and integrity in government and public sector). The work done by the team was internationally recognized. Egypt’s Government electronic and web services rank was 23 out of 192 countries according to the 2010 UN-PAN report and the program received the best service award both from the UN in New York (2009) and the African Union in Johannesburg (2008). Egypt was accepted as a member of the Public Governance Committee in OECD. 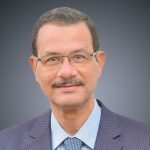 He is a consultant to a number of international organizations (UNDP, UNIDO, UNESCO, FAO, ESCWA, European Union and World Bank), government organizations and companies in Egypt, Middle East, Africa, Europe and United States.